If Boeing's latest vision gets off the ground, a hybrid propulsion concept similar to the engine-battery pairings increasingly seen in passenger cars could be aviation's answer to the fuel burn and emissions dilemma. 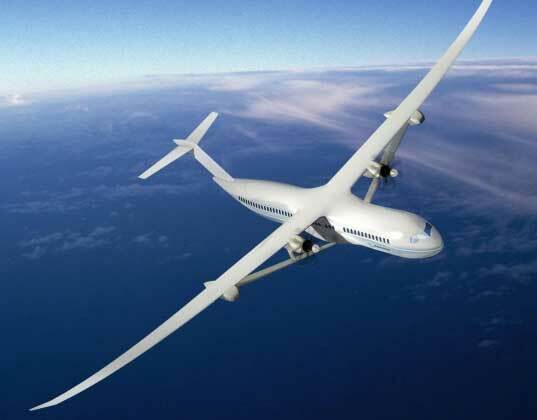 The research and technology people at Boeing reckon their concept for a 737-sized aircraft could be reality by 2035 if sufficient advances in battery technology can be achieved - but they admit that the battery question is a big if. The conceptual aircraft, known as Sugar (Subsonic Ultra Green Aircraft Research) Volt, was one of five designs submitted by Boeing following an 18-month research challenge set by NASA. The goal was to design a 2030-era aircraft that burns 70% less fuel and emits 75% less nitrogen oxide than today's airliners. Sugar Volt is a twin-engined aircraft fuelled by a combination of jet fuel and battery power. "We've added an electric motor to the shaft that drives the fan so that during take-off you run the gas turbine as usual, but you can also use the battery to get more power," says Marty Bradley, who heads Boeing's subsonic research team. He adds that the extra thrust provided by the battery could shorten take-off time. When the aircraft reaches cruising altitude it can switch from burning jet fuel to using the battery-powered electric motor. Sugar Volt is designed to carry 154 passengers. It has a maximum range of 3,500nm (6,480km) and a 61m (200ft) wing span, although the wings are designed to fold so the aircraft can fit into the same airport gates served by today's narrowbodies. Boeing says the aircraft would emit 65% less carbon dioxide than today's single-aisle aircraft, but an 80% reduction could be achieved if biofuels were used instead of kerosene. This reduction includes the US power grid emissions used to charge the batteries before flight. The hybrid electric propulsion system could also reduce NOx emissions by as much as 85%. Bradley is keen to stress, however, that at present there is no battery powerful enough to make this vision a reality. Sugar Volt would require a battery that offers 750 watt hours/kg, but the best batteries in existence today only achieve 170-180 watt hours/kg. "That's the bar we set for the battery technology folks. If they can reach that then we have an approach where we can compete with conventional aircraft. It's a stretch for them, but the technology is out there - we will just have to see if it evolves," says Bradley. An improved version of the most advanced lithium ion battery is one possibility, while lithium air battery technology improvements could also form the basis of what is required. "If you take today's most advanced battery and improve it by 7-8% a year, by 2035 it might be ready," says Bradley, adding that Boeing is "calling for dialogue with the battery technology people".